Being an ‘unsung hero’ in sports can have a variety of meanings. One thing they have all provided is consistent value to their team. In the NBA, unsung heroes have been starters, bench players, and everything in between. The term can apply to multiple types of players and their individual impacts. Milwaukee might be Giannis Antetokounmpo’s team, but guard Malcolm Brogdon is a big factor in the Bucks’ overall success. Brogdon had the best season of his career in 2018-19, averaging personal bests across the board. In 64 games, the former NBA Rookie of the Year averaged 15.6 points, 4.5 rebounds, and 3.2 assists per game, while shooting a robust 42.6 percent from three and an NBA-leading 92.8 from the free-throw line. Not only is Brogdon an efficient, underrated offensive player, but he’s a plus defender who doesn’t make a lot of mistakes. 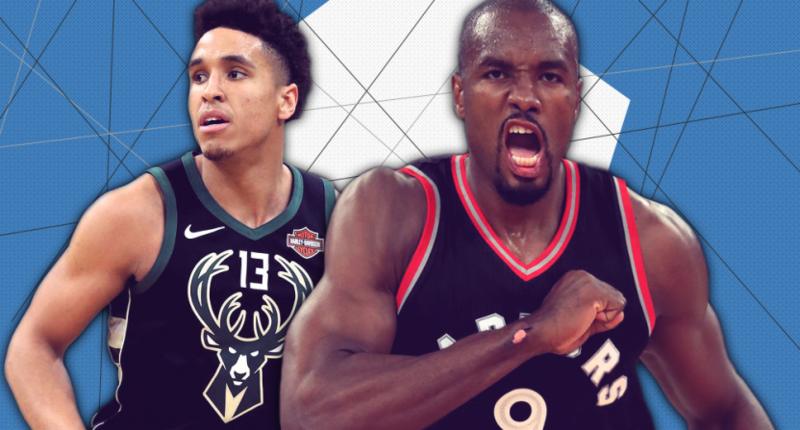 At 26, Brogdon might be the NBA’s most underrated player. He does so many things well on the court and doesn’t need the ball in his hands on a nightly basis to be successful. Unfortunately for Milwaukee, Brogdon won’t be available in their first-round matchup against the Detroit Pistons due to plantar fascia. His value to the Bucks will be evident, as they try to carry on without him. In his third year in Toronto, Ibaka is having his best season with the Raptors in a role better-suited to his strengths. In an ever-changing situation thanks to multiple trades and lineup combinations, Ibaka has remained consistent. Whether he’s starting or coming off the bench, Ibaka has been a regular contributor despite being the third or fourth option in Nick Nurse’s offense. He ranks third on the Raptors averaging 15.0 points per game, while leading the team in rebounds (8.1) and blocks (1.4) per game. He’s an active defender in the post, and can score in the post and from range. Ibaka had an off season in 2017-18, but has been rejuvenated under Nurse’s more offense-oriented playcalling. Even in a role behind Kawhi Leonard, Kyle Lowry, and Pascal Siakam, Ibaka has provided quality minutes no matter what he has been asked to do. The 76ers’ roster has experienced plenty of turnover this season, as ‘The Process” has evolved into a win-now mindset. There were a few players worth considering for Philadelphia’s unsung hero: Robert Covington, Landry Shamet, or Wilson Chandler – but they have been traded as the season progressed. With those players gone, JJ Redick takes the honors with another fabulous season. In 76 games, Redick has averaged a career-best 18.1 points per game, consistently filling the bucket despite an ever-changing supporting cast. As he has for most of his career, Redick has made three-pointers at a high clip and remained efficient at the free-throw line. Defensively, Redick ranks below-average defensively, but his shooting opens up the floor for superstars Joel Embiid and Ben Simmons. He’s extremely valuable to the 76ers. The Warriors are the most star-studded team in the NBA. But Looney — a former first-round pick — has stepped up and become the team’s unsung hero, even if he hasn’t filled up the stat sheet like Steph Curry, Klay Thompson, and Kevin Durant. The fourth-year pro has done everything the Warriors have asked him to do. He filled in admirably for an injured DeMarcus Cousins to start the season, providing excellent defense and efficient scoring around the rim. In 2018-19, Looney has established career-highs with 6.3 points, 5.2 rebounds, 1.5 assists per game, while shooting 62 percent from the field. He hasn’t posted eye-popping numbers, but his energy and hustle have been huge for Golden State. lar minutes on the NBA’s best team. Looney will get a nice contract in free agency this summer. Beasley’s first two seasons in the NBA were largely forgettable. Selected 19th overall in the 2016 NBA Draft, he had a minuscule role for the Nuggets, never averaging 10 minutes per game in either season. In 2018-19, Denver has given Beasley more responsibility and the shooting guard has responded with a breakout year. Beasley has more than tripled his scoring output this season, averaging a career-best 11.3 points per game, while shooting 40.2 percent from the field. He has provided a jolt off the bench for the low-scoring Nuggets and stolen some games for the team down the stretch. He’s Denver’s best high volume three-point shooter. Without him, the Nuggets bench and scoring depth would be in trouble. At one point, Beasley’s career appeared to be going nowhere. This year, he finished fifth on the Nuggets in scoring while shooting the lights out as a sixth-man. In New York, Kanter played like his usual self. He scored in bunches, was a very good rebounder, and played next to no defense. His relationship with the Knicks soured after he was bizarrely benched, so when he was picked up by the Blazers, it seemed to be a great fit. Kanter would serve as Jusuf Nurkic’s backup and provide some quality minutes off the bench. Unfortunately for the Blazers, Nurkic went down with a season-ending knee injury, but Kanter has done an impressive job filling in during his absence. As a starter, Kanter posted 20+ point games and double-doubles in five of his last six games to close the season. While his defense is still a work in progress, he has stepped up and given the Blazers a much-needed boost at center. The Trail Blazers’ playoff hopes would be completely shot if it wasn’t for the late-season acquisition of Kanter. It’s weird how such a seemingly minor move has had such an impact.